Olympia Time: When was the last gray wolf shot in Thurston County? When was the last gray wolf shot in Thurston County? Wolves are on their way back in Western Washington. At one point in our past, wolves roamed the place we now call home. Certainly Thurston County was on the edge of where these big dogs roamed, but obviously there were some that roamed down the Black Hills from the Olympics. The last wolf pair was shot in the Olympics in 1938. That was the absolute end of wolfs in Washington until very recently. Joe Easterday came back home from a hunting trip that year, ranging from the Black Hills down to Oyster Bay. Among the dozens of animals he and his friends shot was a "timber wolf." He pointed out that he likely would have stayed out longer, but the number of animals he had bagged was just too many to lug around. He says he would have been still in the woods if it was not for the fact that has shot so much that his arm is swollen and his fingers have increased to such a size that he can no longer pull the trigger. He visited a doctor to have his arm and hand attended to and while here will have his clothes padded so that his shoulder and side will not get black and blue in the future from the recoil of the weapon. The expanding human footprint, plus "varmint hunts" and other likewise less than nice ways to say predator extermination programs, did the wolves in. 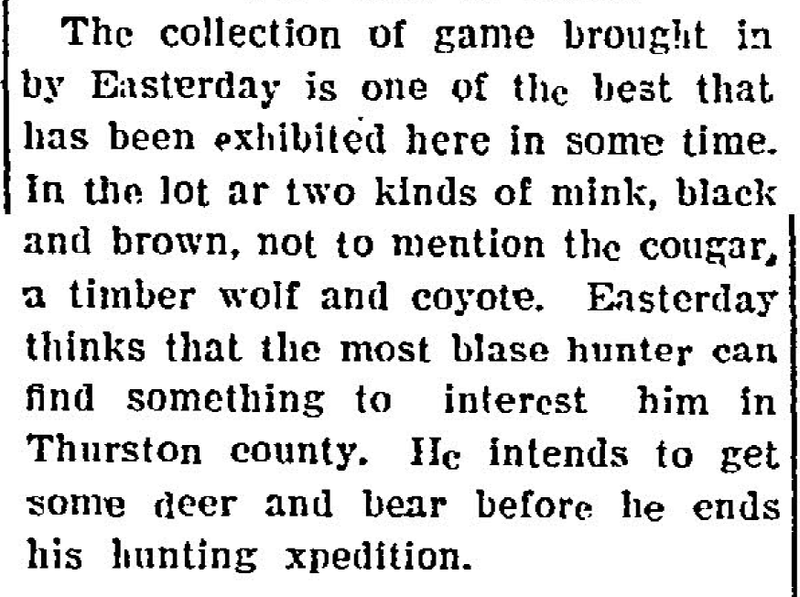 A notice for a varmint hunt in the 1911 Olympian listed the points given out by the Thurston County Association for the Protection and Propagation of Game and Game Fish. Two teams worked from May 1911 to February of the next year. The top hunter of either group would get $20, with lesser prizes for second and third. The losing team would throw a party for the winning side. If you shot a cougar, your team would get 1,000 points. A wolf, 750 and likewise for a coyote. A fisher would get 500 points. And, last on the list of a dozen animals and their corresponding points, was the blue jay. That would get you 75 points for your team. Just in case you're wondering, I'm very pro-hunting. Very pro-killing animals for food. And, sport for that matter. Food is a higher moral calling though. That said, I'm also pro-eating chocolate cake. But, no one should eat so much cake, or hunt so many animals, they literally have to go see a doctor about it.